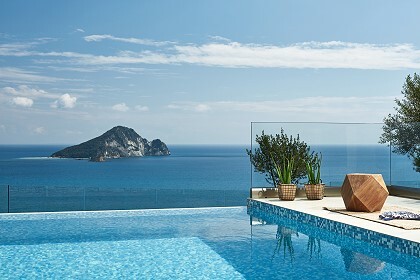 Zinos Villa is located in the Lithakia village of Zakynthos Island, a settlement near the worldrenowned resort of Laganas. 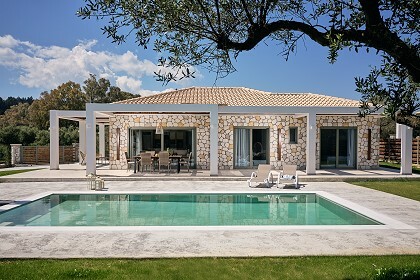 It is a wonderful holiday home, luxurious and stylishly decorated, with a swimming pool, fenced private outdoor spaces and a lovely view of the Ionian Sea! 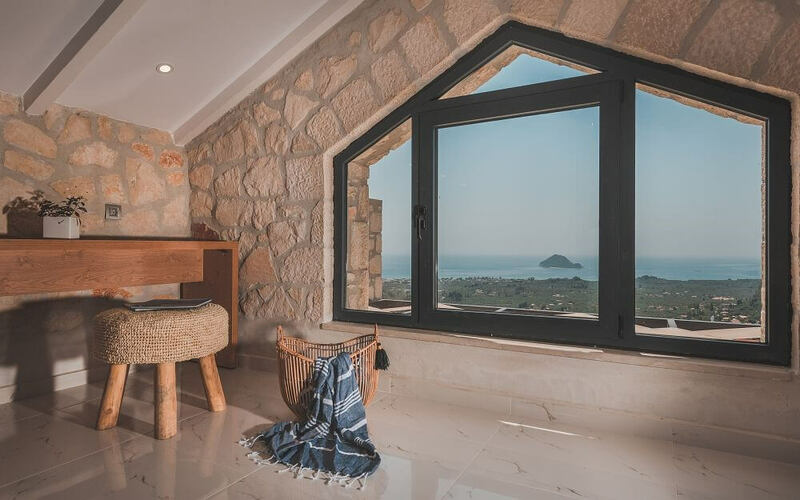 The two-story Zinos Villa measures 150 square meters and can accommodate up to 8 guests in its spacious rooms. 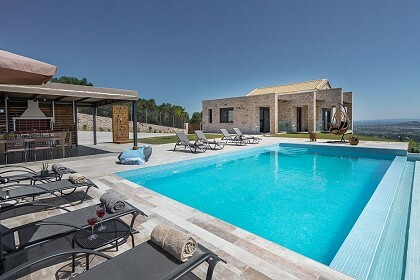 Entering the villa, on the ground floor, the guests will find two bedrooms, one with a queen-sized bed and an en-suite bathroom and the other with two single beds (which can of course be combined into a queen-sized one) and an en-suite bathroom. There is also a spacious living room, a fully-equipped kitchen and an extra bathroom. 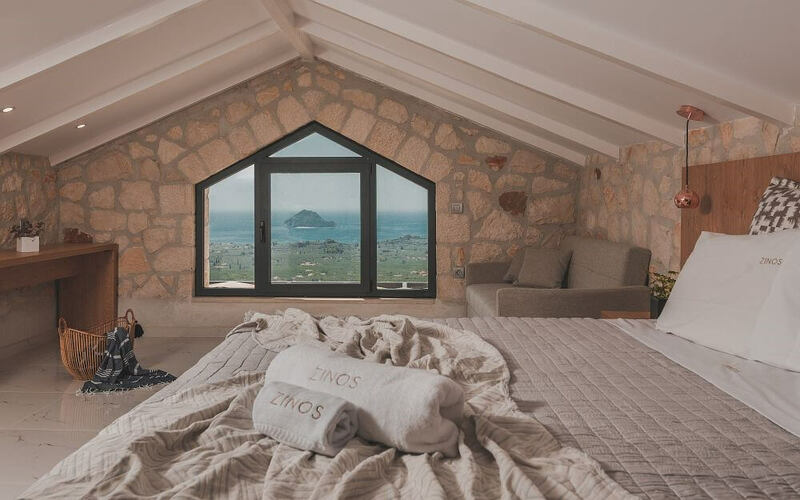 Walking up the stairs to the first floor, the guests will find an attic master suite with a kingsized bed, a small living room, an en-suite bathroom and a veranda which enjoys a great view of the surrounding area and the sea. There is also an office with a PC and a printer. 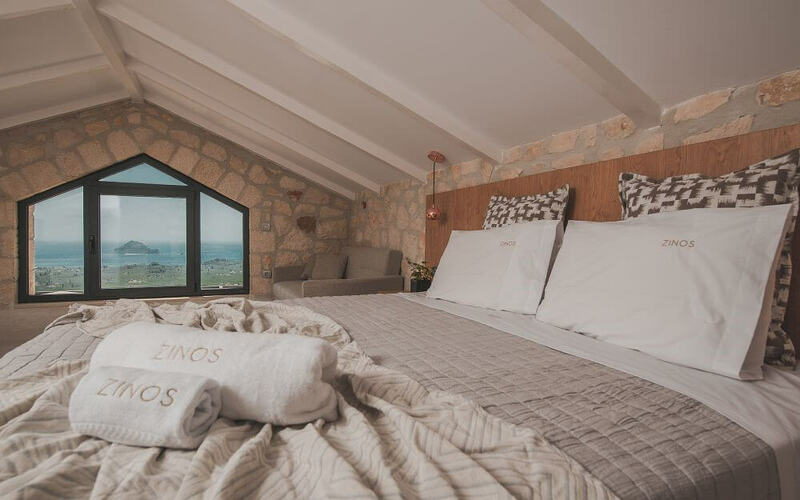 In total, Zinos Villa features four bathrooms, all equipped with showers. 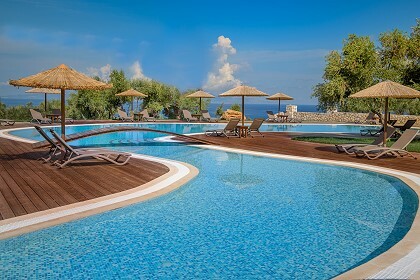 Of course, there is a spectacular swimming pool, which will offer you plenty of relaxing hours under the sun. There are sunbeds, parasols and outdoor showers in the fenced gardens, which offer you privacy and make Zinos Villa perfect for families with children! 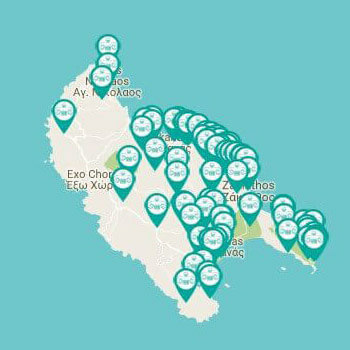 Zinos Villa offers private parking, free WiFi in all rooms and public areas, pool towels, bathroom products, 24-hour hot water and many more. Other extra services such as car, motorcycle and bicycle rentals, yacht charters, BBQ nights, breakfast/lunch/supper, can be arranged upon request and with an extra charge. Zinos Villa is located in the area of Lithakia, Zakynthos Island, a few minutes’ drive away from the famous resort of Laganas, where you can find plenty of restaurants, bars and coffee shops to visit, as well as many activities to participate in, such as watersports and loggerhead turtle spotting! Laganas is part of the National Marine Park, which was created for the protection of the endangered loggerhead turtles.